Hugh Broughton knows the Spanish capital’s buildings intimately but the one that really stood out was Rafael Moneo’s magnificent art gallery. In 1994 when I was working for Troughton McAslan, my wife and I decided to give up our jobs and spend a year in Spain. I landed a job writing a guide to the modern architecture of Madrid. This was an amazing experience – I got to review 100 buildings and meet many of the architects who had designed them. At the time, although architecture in Barcelona was quite well known internationally following the 1992 Olympics, there was very little coverage of what was happening in Madrid. Out of all the buildings I visited, the one I was most taken with was Rafael Moneo’s Thyssen-Bornemisza Museum. He took what had once been a palace and adapted it into an art gallery for the Thyssen-Bornemisza family, roofing in a courtyard and creating a lovely sequence of enfilade gallery spaces around it. Although it is just down the road from the Prado Museum it is far more reticent. It doesn’t announce itself to the street in any way but instead addresses its quiet garden – you would barely even know it was there. It’s a magnificent restoration, extension and reorganization reorganisation that works with the original architectural principles of the palace. The whole thing was just very understated – modern yet classical and relatively timeless in plan and cross section. It’s a calming space within which to look at paintings, designed by someone who really understood volume and light. The combination of a Colmenar limestone floor and pink-wash walls absorbs light and gives the space great serenity. Moneo’s minimalism represents not so much an expression of modernity, but rather a deep-rooted respect for traditional Spanish architectural values. As a remodeling of a historic building – which we do a lot of – the museum was inspirational in showing the great potential of existing buildings for new use if you take a sharp knife to them in the right way. 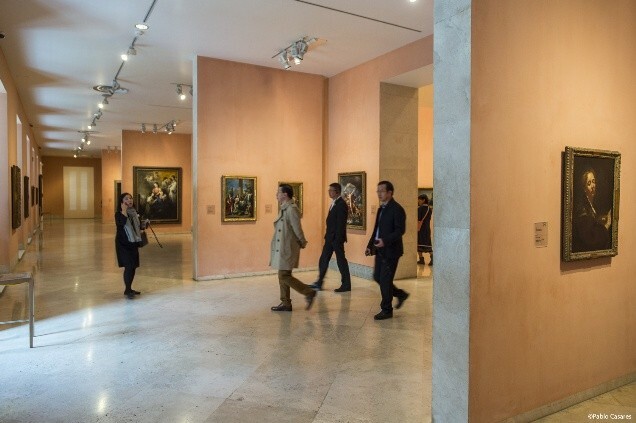 The other reason for choosing this gallery is that we have recently been working on the design of a new gallery that is strongly influenced by the Thyssen-Bornemisza building. Our project for the Harley Foundation on the Welbeck Estate in Nottinghamshire will provide 800sq m of new space within the old walls of a former equestrian building and will house the peerless Portland Collection of decorative arts. In the early stages we showed the Thyssen-Bornemisza conversion to the curators to demonstrate the merits of its circulation system and the use of rooflights to illuminate galleries, which were similar to the approaches we were proposing at Welbeck. I’m a big fan of Moneo. I didn’t get to meet him when writing the book, but I heard him speak last year and he was brilliant. He didn’t talk about any of his buildings but instead spoke about how buildings are made up of history and language and culture, as so eloquently expressed in his work at Thyssen-Bornemisza. This article was first published in Building Design on 21 September 2015.